ARCHANGELS is a company based in God's Country (beautiful sunny Southern California), dealing in Rare and Unique Paper Collectibles. We specialize in vintage Comic Books, Original Comic Book Artwork, Hollywood Movie Posters and other related items as well. We are Senior Advisors to the Overstreet Comic Book Price Guide and a Charter Member Dealer with the Comics Guaranty, LLC (CGC). For other wonderful items, make sure to visit us at our About Me Page. Super-Villain Team-Up #6 Original Splash Art by Herb Trimpe. Powerful Title Splash page for Super-Villain Team-Up #6 by Herb Trimpe (pencils) and Jack Abel (inks). Piece features a gripping full frontal shot of the Mighty Sub-Mariner, incarcerated, angry, frustrated and ready to explode into violent action - just as he was created by Bill Everett back in 1939. 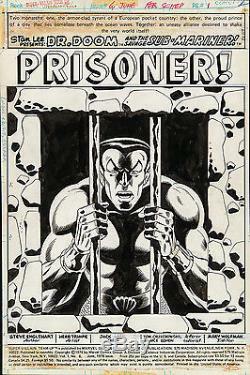 Simply a superb, in-your-face image of Namor that is hard to beat! VG to excellent condition with image measuring 10" x 15". The item "Super-Villain Team-Up #6 Sub-Mariner Splash Art by Herb Trimpe" is in sale since Tuesday, December 30, 2014. This item is in the category "Collectibles\Comics\Original Comic Art\Splash Pages". The seller is "water-walker" and is located in San Diego, California. This item can be shipped worldwide.